Christians have always appreciated the power of communal prayer, and few occasions offer as much opportunity for an intimate, spiritual experience as the prayers said among those gathered around a table sharing a meal in thanksgiving for the gifts God has given them. In These Thy Gifts, Fr. 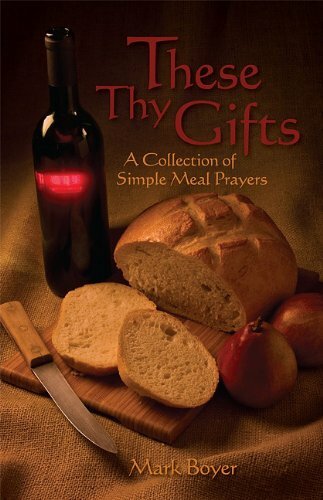 Mark G. Boyer introduces a new collection of mealtime prayers grouped around the liturgical cycle. While written to be prayed in a group setting, these prayers can easily be modified for those eating alone. Boyer includes prayers designed specifically for the Advent and Christmas seasons, Lent, Holy Week, and the Easter season, as well as the weeks of Ordinary Time. In addition, he includes prayers to mark the feast days and solemnities during the year, as well as prayers for birthdays, anniversaries, and other special days. The meal prayers in this book are not designed to replace the saying of grace, but simply to open our eyes to new ways of thanking God for the food set before us. Mark G. Boyer, a priest of the Diocese of Springfield-Cape Girardeau, Missouri, for thirty-five years, is the author of thirty books on biblical and liturgical spirituality. He is currently a monthly columnist for The Priest magazine and a part-time member of the Religious Studies Department of Missouri State University.